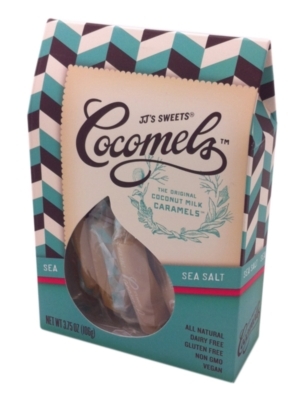 Product Size: 1.5" x 4" x 6.25"
One of the most mouthwatering taste combinations finds near perfection in the Sea Salt Cocomel. With an extra sprinkle of Fleur De Sel, the Sea Salt Cocomel delivers that irresistible blend of salty and sweet in delightful balance. Cocomels are Vegan friendly, Gluten free, Dairy free, Soy Free, GMO free, and they don't use corn syrup. Each candy is individually wrapped for freshness, and the wrapper is fully compostable; even Mother Earth likes these candies! A dozen of the creamiest Coconut milk caramel candies in one box, who could ask for anything more? Cocomels are produced in a shared facility with companies that use dairy, wheat, eggs, tree nuts, peanuts and soy. JJ's Sweets equipment is dedicated to Cocomels and good manufacturing practices are used to prevent cross-contamination. However, JJ's Sweets cannot guarantee that there are no trace amounts of the above allergens.